CFL Multimodal has launched in cooperation with the Chinese company Chengdu International Railway Service Co.(CDIRS), a combined train between Luxembourg and China. To improve supply chain management and to reduce food loss, the Cool Chain Association launches in April perishable data-pilot. 2019 Air Cargo Excellence Awards: Luxemboug Airport twice well ranked! Air Cargo World has presented 2019 Air Cargo Excellence Awards: Luxembourg airport ranked globally as 2nd and 1st in Europe in the category of top 2019 airports below 1 Mio tons of freight. Guichet.lu has published new forms for procedures with the OCEIT. In February 2019, Cargolux Airlines received an international award for Excellence in air cargo in the category International All Cargo Carrier of the Year in Africa at the Air Cargo Africa 2019 conference. Despite Brexit, Luxembourg can benefit a competitive advantage of the digital. The Luxembourg airport has already developed the e-CMR. Cargolux becomes the official partner for Sea Life Trust and Whale and Dolphin Conservation to transport two beluga whales on a specially branded plane. On 11 April 2019, C4L invites you to participate to the Luxembourg Edition of the Supply Chain Day. This is the second time that the "Fresh Hub Luxembourg" takes part in the Trade Fair "Fruit Logistica", in Berlin: from 6 to 8 February 2019. IATA has launched "CEIV Fresh", a new industry certification for perishable goods. Representatives of the United Kingdom and of the European Union decided the postponement of the Brexit date until 12 April 2019. On 12 March 2019, the LCL organized its eXplore conference, involving industry and academy experts about sustainability in the Supply chain. The United Kingdom (UK) is prepared to leave the European Union (EU). Some uncertainties concerning the conditions of the exit remain despite the imminent deadline of 29th March 2019. What are the most immediate consequences regarding customs and VAT? The Union of European Chambers of Commerce, the Chamber of Commerce and the Cluster for Logistics organize a conference about the European politics in Transport & Mobility: 08 March 2019. 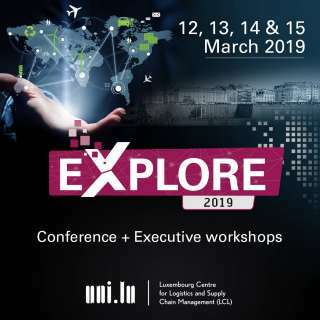 The Luxembourg Centre for Logistics and Supply Chain Management (LCL) at the University of Luxembourg organizes an eXplore conference on 12 March 2019. In 2018, Luxembourg Airport recorded a significant increase in cargo volume. In 2018, Cargolux recorded a significant growth in live animal transportation, and especially in horses transport. Luxair Luxembourg Airlines carried more than 2 million passengers in 2018. The SWL web portal celebrates its 1-year anniversary. Discover a few facts... and help us improve.